I don’t have an account there. Could you please post some pictures Bruce? I saw a vertically orientated version of that which looked pretty impressive. I’m not understanding the part on top that looks like a half barrel. What’s it do? 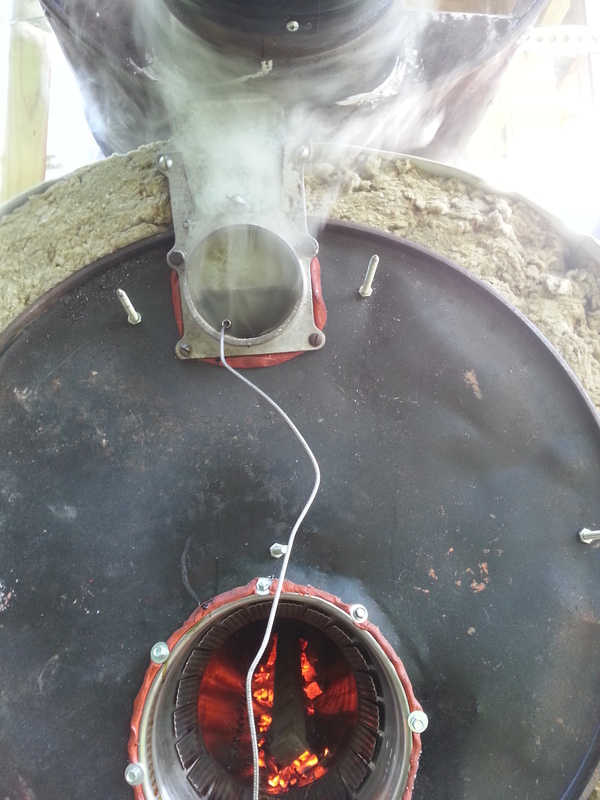 The half barrell is an afterburner to clean up smoke and provide heat for drying feed stock. James’ and my retorts are based on the Anila stove designed by Professor RV Ravikumar of India. 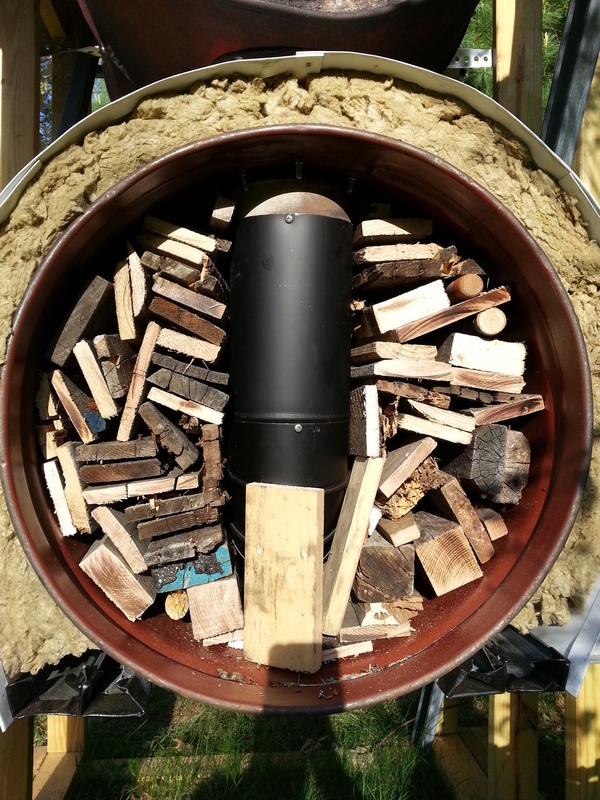 James cleverly combined the rocket stove and anila stove. Insulation is the key. I have, since the picture, added insulation under the barrel as well. I built many variations until settling with this. My horizontal design is easier to empty and the flue along the bottom gives a longer heat exchange area. Several gas entry holes are along each side of the bottom of the internal flue. The external finned air inlet, which I call a turbinator, swirls the primary air and significantly increases efficiency by enhancing the the third T of combustion: Time, Temperature and Turbulence. The glowing circle in the center of the turbinator is a sight glass. The startup time can be reduced to 20 minutes by directing a hair dryer or other blower Into the fire. This slight positive pressure from the blower also helps drive off moisture through the steam vent. When the venting gases sustain combustion, close the vent, install turbinator and let her rip (there is an audible roar). Pyrolysis continues for another 1 hour 45 minutes. Seal by replacing the turbinator with a duct plug, close the chimney damper and let cool. If built as a barrel in a barrel, ashes can be used as the insulation. The flue for this one is SS chimney liner and was free. Picked up as scrap leftover from a local stove shop. 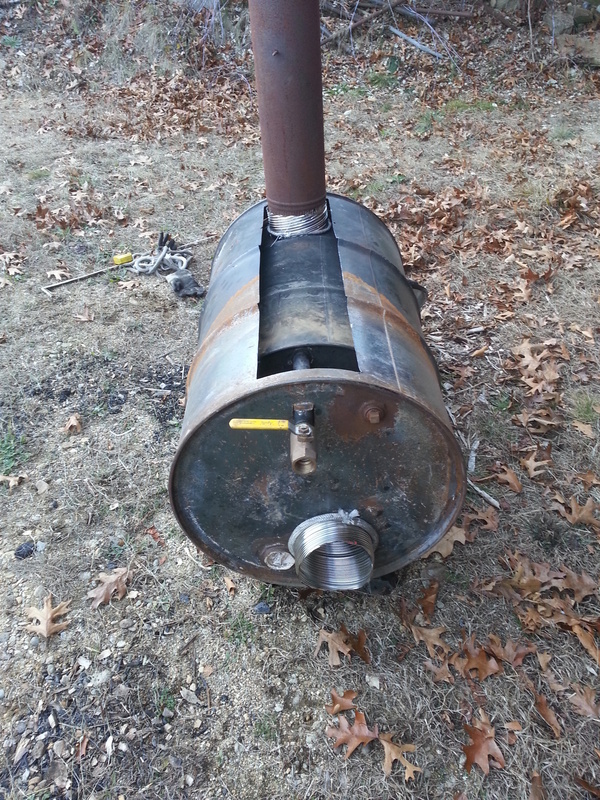 your stove pyrolysis I really like. You’ve probably worked very hard to develop. The Turbinator looks like a propeller to provide a rotational movement has primary air? Water vapor could exit through the holes from the pipe of stove. Yes the fins in the turbinator swirl the incoming primary air. The fins are formed by making Square C-shaped cuts in a flue cap, then bending inward at 45 degrees. The sight glass is not needed but it allows a clear view of the swirl. Again, the turbinator is not necessary, but here is a marked difference in the intensity of the fire with this addition. The turbinator doesn’t have to be incorporated into the retort. 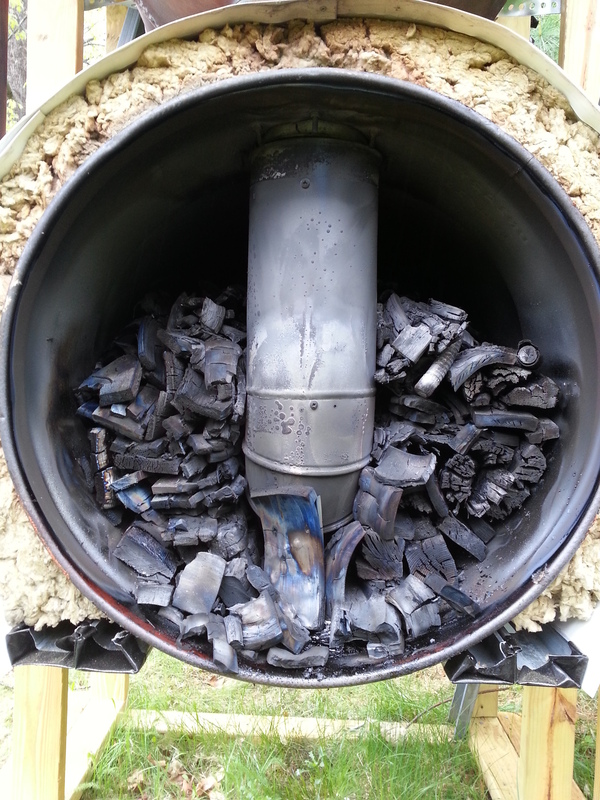 The effect can be accomplished more simply by using a 8" to 6" reducer added on to the flue outside of the retort. By increasing to 8", the opening area of the fins allows greater airflow. A 6" turbinator on a 6" pipe would restrict the primary air so much as to decrease burn efficiency. For those using a Hookway retort, using a blower for start up then sticking a turbinator on the inlet once pyrolysis gases start burning will drastically improve performance. We’re you trying to upload to this site or to you tube? This site will upload photos but to upload videos, you need to upload to you tube which is what most of us use and then copy and past the link to your post here. Looking forward to see how you make it. That “white charcoal” is really amazing. OK Don, I´ll do it that way and I´ll let you all know. Thanks for the information. 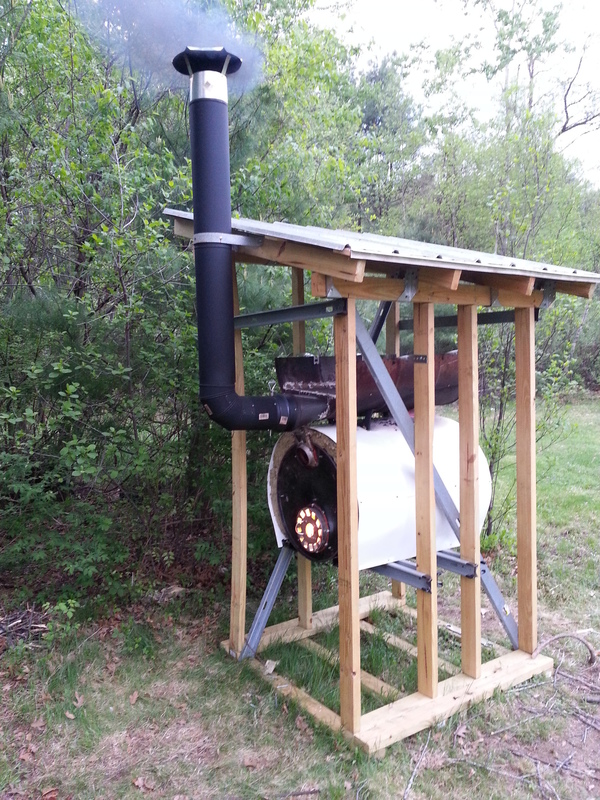 “Gary Gilmore, My start to building a charcoal gasifier”. I believe the only way to move posts are: A. Copy all the info from that post, paste it to a new post here, and delete the old post; or B. Ask @Chris nicely and he can move things when he gets a moment.